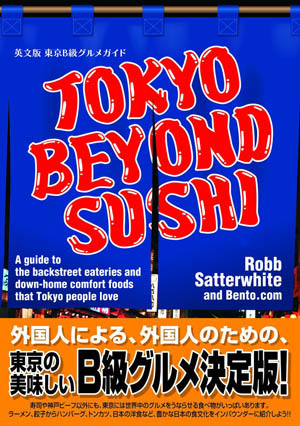 Open 7am-11pm (LO; Sat 11-11, Sun 11-9) daily. This comfortable office-district dining spot serves an eclectic menu of tasty dishes from Austria, Hungary, Germany and Holland along with European beers and budget wines. 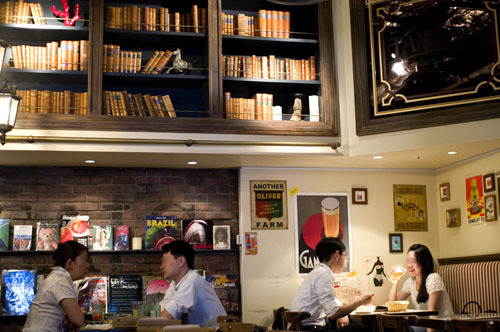 Although it faces a busy corridor in an office-building basement next to Otemachi station, the interior is surprisingly homey, with floor-to-ceiling bookshelves, magazines to browse and a den-like ambience. 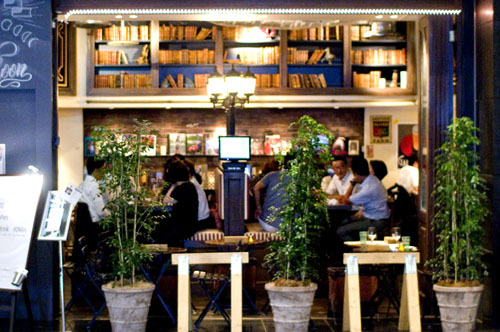 There's a stand-up bar area up front, and in the daytime the restaurant turns into a cafe with exotic coffees. The kitchen does an admirable job of tackling recipes from all over eastern Europe, with choices like Eisbein (German-style pig's knuckle), Backhendl (Viennese fried chicken), Wienerschnitzel, and Bigos (Polish hunter's stew). We were quite happy with our excellent Hungarian-style roast lamb, which was very tender and noticeably gamier and deeper in flavor than the Mediterranean-style lamb dishes usually found in Tokyo. 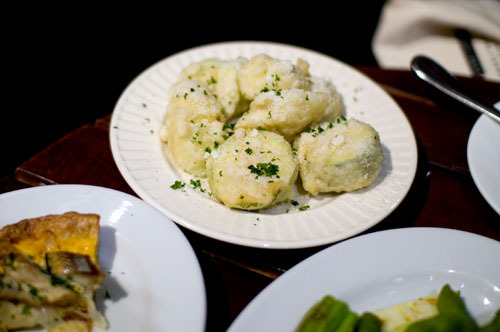 Zucchini fritters were wrapped in a thick coat of breading and retained a satisfyingly firm texture. Fried potatoes were also skillfully done and nicely seasoned - it seems like deep-fried delicacies, prepared in a distinctive Eastern European style, are one of the strong points here. We also enjoyed a Dutch-style herring and cheese pie - now that's really something you don't see every day. Our otoshi was a platter of roast vegetables with a cold anchovy dipping sauce - kind of a stripped-down version of the ubiquitous bagna cauda - which did its job as an appetite-whetter very well. Wines start at Y2300 per bottle, and other drinks options include Czech beers, a few crafty beer choices and some unusual Eastern European Cocktails. 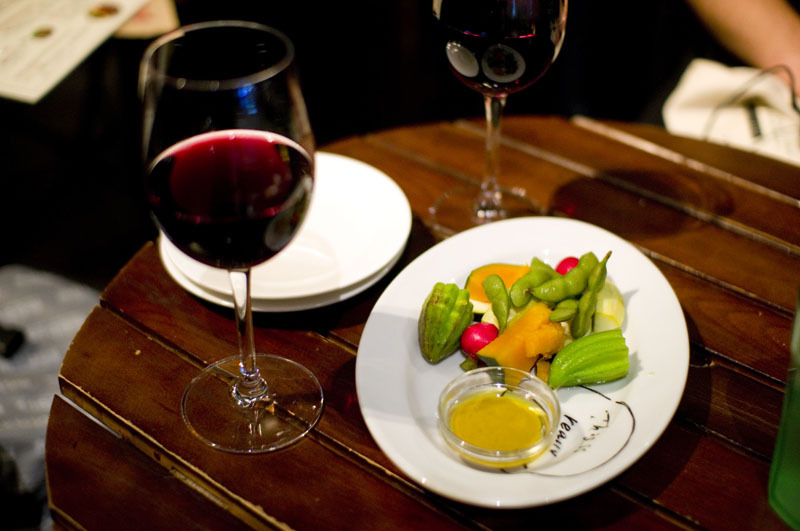 During Happy Hour (2-7pm weekdays) you can get one drink and a small tapas-style plate of food for Y980. Budget around Y3000-4500 at dinnertime, or Y1000 at lunchtime.